My tour de force for the upcoming week, a feat requiring great virtuosity and skill, will be the tossing of these shoes into the garbage. For this child of a hoarder, such matters are handled with gravity. In the end I’ll have an exhilarating victory. Perhaps they still have a little life left in them, eh? Even I can see that it’s time to cycle up my next pair of lawn shoes that have reached the end of the line. This pair, however, goes out in a blaze of glory. The sneakers should be fairly caked in mud after we enjoy our last project together today. I have planned this. The story illustrates perfectly what it is like for a hoarder to get rid of anything. In my case this particular tale fills all my requirements for having a trusted pair of shoes interred into a landfill where they’ll rest in peace until the end of time. You can take the boy out of the hoarder, but not the full hoarder out of the boy. A stable family life prevents me from going on a full-blown drunk of hoarding, but daily it manifests itself in ways like this. Besides shoes, papers are an admitted problem. I will even snip the last empty third of a business letter that otherwise would go wasted, or save the back side for a repurposed life altogether. In church I cringe when my children, who are quietly drawing on the full canvas of an empty sheet, not only refuse to use both sides, but only fill up a small part of one side. Small arguments pop up from the verdant soil of our marriage like mushrooms when my wife uses a full sheet of blank paper to jot down a small shopping list. Oh this chaps my hide! These shoes mean something to me. I actually love them. I would happily bury them and build a monument to their memory. They were the old running shoes of a great friend of mine that I consider a brother, and due to distance only see in person a couple times per year. Since they didn’t fit him properly and still had plenty of life, he gave them to me when I remarked that I couldn’t justify buying an extra pair of shoes that were needed. When I happily came to collect them I saw his mom for the last time before a debilitating ALS wiped out her power of speech, and will some day tragically take this beautiful woman’s life. Even then the scourge was secretly at work, unbeknownst to anyone. She is a loving mom to four wonderful children created in the image of God, and which bear her gentle, patient, and kind manner. The woman has poured her life into them and the husband everyone thought would go before her. She has loved and been loved, known and been known…. I am grateful for her son who adores her, and has been a ballast in my life. 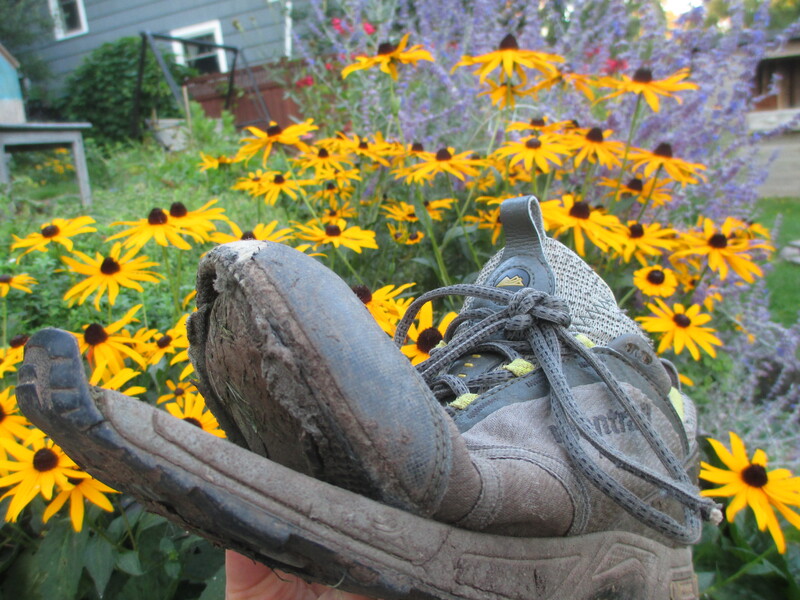 For three years these shoes have served me as I mowed the lawn, fed the chickens, turned the compost, walked the dog, and have led an active life in them. This is how a hoarder thinks, and I am astonished to realize I am one. Forever recovering, but one nonetheless. We love objects and hold on to them as cherished possessions. All these feelings come out from a ratty old pair of shoes. When shoes were donated to Mother Teresa’s charity in India, she was the first one to dive into the pile to find a new pair for herself. She hunted for the worst pair she could find, perhaps in such a condition as this, so others could have better. The pants I’m wearing are 17 years old. These ancient green corduroys are of college vintage and wildly out of style. T-shirts are a persistent problem. I might love them even more than shoes, and long for the day when my wife will make a t-shirt quilt or pillow case for me. The one from the Potato Museum on Prince Edward Island is full of holes, 15 years old, but is a cherished item from our honeymoon. It baffles me that my wife urges me to cut such an item up into rags for an ignominious ending (such as wiping the rim of the toilet) to an item that has served me so well. Therefore, I pause and think hard before every purchase. Sometimes a gift that doesn’t quite make the mark will cause me to inwardly groan, because I know that I may be saddled with it for 20 years. Daily I am thankful for being pulled out of that mess. My story goes on to contain incredible adventures that formed me into a bonafide human. Previously I had been consumed by loneliness, shame, and meaninglessness. I have never fully shared these stories with anyone before, and being an only child of a single parent has meant there hasn’t been a single person on earth that can fully relate. Half goes into great detail about my childhood, which not only involves extreme hoarding, but intense conflict, near death experiences, and even love. The second half is a redemption story. It involves 9 months of rebirth through faith, an escape from the real world, and a coming-of-age adventure. Make it a great week people! Love someone deeply in your life, and simplify, Simplify, SIMPLIFY! 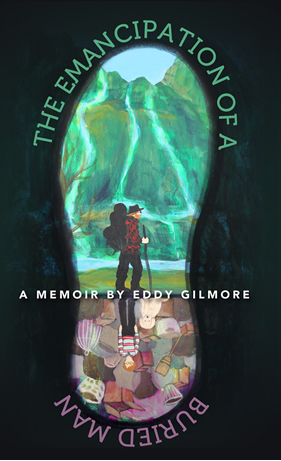 Bookmark eddygilmore.com to follow progress on my book, or like me on Facebook at Eddy Gilmore – Author. The small matters of editing and figuring out the publishing process remain, but I hope to release it in 2015.